#typeyeahtuesdays 2017 Instagram Lettering Challenge | Typeyeah. Ohhhh yeah Tuesday here we come!! This weeks #typeyeahtuesdays entry goes to @rozimandias with their awesome lettering of the #typeyeahlogo 👏🏻 Join the challenge by designing your best version of the ‘Typeyeah’ logo and post it to Instagram with the hashtag #typeyeahlogo Each Tuesday a favourite will be selected and featured on the page. Ohhhh yeah Tuesday here we come!! This weeks #typeyeahtuesdays entry goes to @studiofabianfischer with his epic lettering of the #typeyeahlogo 👏🏻 Thank you for the support Fabian! Join the challenge by designing your best version of the ‘Typeyeah’ logo and post it to Instagram with the hashtag #typeyeahlogo Each Tuesday a favourite will be selected and featured on the page. Ohhhh yeah Tuesday here we come!! This weeks #typeyeahtuesdays entry goes to @capitan_moy with his awesome lettering of the #typeyeahlogo 👏🏻 Join the challenge by designing your best version of the ‘Typeyeah’ logo and post it to Instagram with the hashtag #typeyeahlogo Each Tuesday a favourite will be selected and featured on the page. You know what day it is! This weeks #typeyeahtuesdays entry goes to @joshstevensdesign with his epic lettering of the #typeyeahlogo 👏🏻 Join the challenge by designing your best version of the ‘Typeyeah’ logo and post it to Instagram with the hashtag #typeyeahlogo Each Tuesday a favourite will be selected and featured on the page. You know what day it is! This weeks #typeyeahtuesdays entry goes to the legend @jexpo76 with his epic lettering of the #typeyeahlogo 👏🏻 Thanks Rodney for your support! Check his profile for the full series of designs from the other fantastic typography community profiles. Join the challenge by designing your best version of the ‘Typeyeah’ logo and post it to Instagram with the hashtag #typeyeahlogo Each Tuesday a favourite will be selected and featured on the page. You know what day it is! This weeks #typeyeahtuesdays entry goes to @toabeto with his neon lettering of the #typeyeahlogo 👏🏻 Join the challenge by designing your best version of the ‘Typeyeah’ logo and post it to Instagram with the hashtag #typeyeahlogo Each Tuesday a favourite will be selected and featured on the page. You know what day it is! This weeks #typeyeahtuesdays entry goes to @_carlossiqueira with his epic lettering of the #typeyeahlogo 👏🏻 Join the challenge by designing your best version of the ‘Typeyeah’ logo and post it to Instagram with the hashtag #typeyeahlogo Each Tuesday a favourite will be selected and featured on the page. You know what day it is! This weeks #typeyeahtuesdays entry goes to @kisromisaputra with his sweet lettering of the #typeyeahlogo 👏🏻 Join the challenge by designing your best version of the ‘Typeyeah’ logo and post it to Instagram with the hashtag #typeyeahlogo Each Tuesday a favourite will be selected and featured on the page. You know what day it is! This weeks #typeyeahtuesdays entry goes to @kosmofish.words with their sweet lettering of the #typeyeahlogo 👏🏻 Join the challenge by designing your best version of the ‘Typeyeah’ logo and post it to Instagram with the hashtag #typeyeahlogo Each Tuesday a favourite will be selected and featured on the page. You know what day it is! This weeks #typeyeahtuesdays entry goes to @yozatic with his rad lettering of the #typeyeahlogo 👏🏻 Join the challenge by designing your best version of the ‘Typeyeah’ logo and post it to Instagram with the hashtag #typeyeahlogo Each Tuesday a favourite will be selected and featured on the page. You know what day it is! This weeks #typeyeahtuesdays entry goes to @danielhosoya with his epic lettering of the #typeyeahlogo 👏🏻 Join the challenge by designing your best version of the ‘Typeyeah’ logo and post it to Instagram with the hashtag #typeyeahlogo Each Tuesday a favourite will be selected and featured on the page. You know what day it is! This weeks #typeyeahtuesdays entry goes to @additif with his sweet pencil lettering of the #typeyeahlogo 👏🏻 Join the challenge by designing your best version of the ‘Typeyeah’ logo and post it to Instagram with the hashtag #typeyeahlogo Each Tuesday a favourite will be selected and featured on the page. 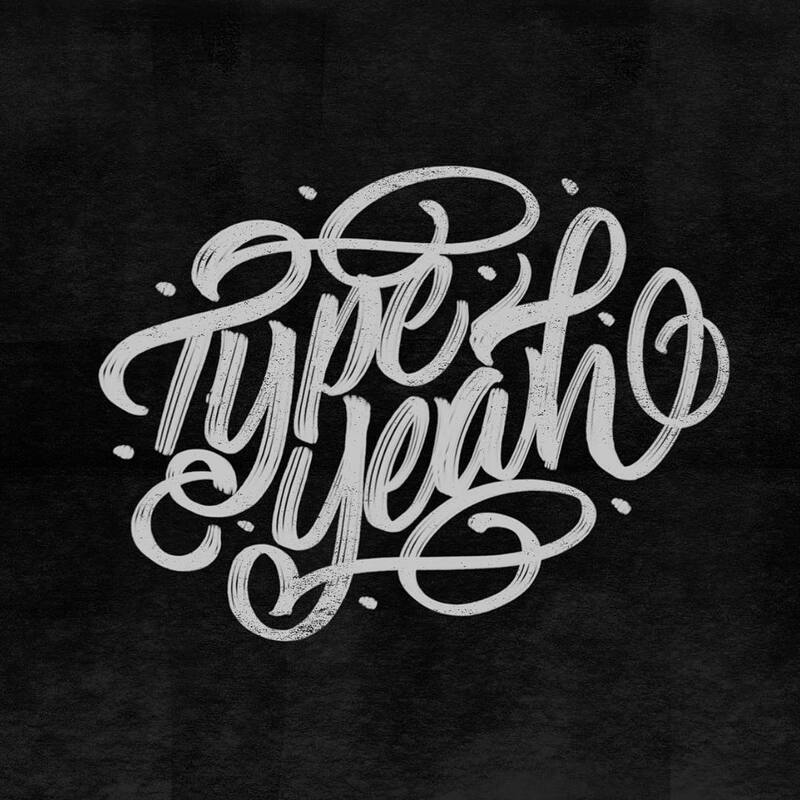 Thank you to the Typeyeah. community for the support and encouragement you all give to each other on your journeys. Everyone is at different stages and it’s so great to see people connecting and helping each other out. ❤️ This weeks #typeyeahtuesdays entry goes to @inkognito_design with his clean lettering of the #typeyeahlogo 👏🏻 Join the challenge by designing your best version of the ‘Typeyeah’ logo and post it to Instagram with the hashtag #typeyeahlogo Each Tuesday a favourite will be selected and featured on the page. Fresssssh! This weeks #typeyeahtuesdays entry goes to @sambarilove79 with his epic lettering of the #typeyeahlogo 👏🏻 Join the challenge by designing your best version of the ‘Typeyeah’ logo and post it to Instagram with the hashtag #typeyeahlogo Each Tuesday a favourite will be selected and featured on the page. You know what day it is! This weeks #typeyeahtuesdays entry goes to @akira.hl with his epic lettering of the #typeyeahlogo 👏🏻 Join the challenge by designing your best version of the ‘Typeyeah’ logo and post it to Instagram with the hashtag #typeyeahlogo Each Tuesday a favourite will be selected and featured on the page. Who’s keen for a massive Tuesday! This weeks #typeyeahtuesdays entry goes to @mich43lk with his epic lettering of the #typeyeahlogo 👏🏻 Join the challenge by designing your best version of the ‘Typeyeah’ logo and post it to Instagram with the hashtag #typeyeahlogo Each Tuesday a favourite will be selected and featured on the page. You know what day it is! This weeks #typeyeahtuesdays entry goes to @seancampbelldesign with his great concept of the #typeyeahlogo 👏🏻 Join the challenge by designing your best version of the ‘Typeyeah’ logo and post it to Instagram with the hashtag #typeyeahlogo Each Tuesday a favourite will be selected and featured on the page. You know what day it is! This weeks #typeyeahtuesdays entry goes to @toabeto with his rad lettering of the #typeyeahlogo 👏🏻 Join the challenge by designing your best version of the ‘Typeyeah’ logo and post it to Instagram with the hashtag #typeyeahlogo Each Tuesday a favourite will be selected and featured on the page. Pumped for Tuesday!!! This weeks #typeyeahtuesdays entry goes to @ark_eleven with his rad type work of the #typeyeahlogo 👏🏻 Join the challenge by designing your best version of the ‘Typeyeah’ logo and post it to Instagram with the hashtag #typeyeahlogo Each Tuesday a favourite will be selected and featured on the page. You know what day it is! This weeks #typeyeahtuesdays entry goes to @designermike with his sweet lettering of the #typeyeahlogo 👏🏻 Join the challenge by designing your best version of the ‘Typeyeah’ logo and post it to Instagram with the hashtag #typeyeahlogo Each Tuesday a favourite will be selected and featured on the page. You know what day it is! This weeks #typeyeahtuesdays entry goes to @disvo with his epic lettering of the #typeyeahlogo 👏🏻 Join the challenge by designing your best version of the ‘Typeyeah’ logo and post it to Instagram with the hashtag #typeyeahlogo Each Tuesday a favourite will be selected and featured on the page. You know what day it is! This weeks #typeyeahtuesdays entry goes to @okipamungkas with his brilliant lettering of the #typeyeahlogo 👏🏻 Join the challenge by designing your best version of the ‘Typeyeah’ logo and post it to Instagram with the hashtag #typeyeahlogo Each Tuesday a favourite will be selected and featured on the page. Super pumped for today! This weeks #typeyeahtuesdays entry goes to @abdidzel with his epic lettering of the #typeyeahlogo 👏🏻 Join the challenge by designing your best version of the ‘Typeyeah’ logo and post it to Instagram with the hashtag #typeyeahlogo Each Tuesday a favourite will be selected and featured on the page. You know what day it is! This weeks #typeyeahtuesdays entry goes to @prosto_takoe with his epic artwork of the #typeyeahlogo 👏🏻 Join the challenge by designing your best version of the ‘Typeyeah’ logo and post it to Instagram with the hashtag #typeyeahlogo Each Tuesday a favourite will be selected and featured on the page. Doing 2 #typeyeahtuesdays entries this week! @yadibastian has done some rad type work for the #typeyeahlogo 👏🏻 Join the challenge by designing your best version of the ‘Typeyeah’ logo and post it to Instagram with the hashtag #typeyeahlogo Each Tuesday a favourite will be selected and featured on the page. A fresh start to Tuesday! This weeks #typeyeahtuesdays entry goes to @shofiesulhan24 with his epic lettering of the #typeyeahlogo 👏🏻 Join the challenge by designing your best version of the ‘Typeyeah’ logo and post it to Instagram with the hashtag #typeyeahlogo Each Tuesday a favourite will be selected and featured on the page. You know what day it is! This weeks #typeyeahtuesdays entry goes to @_rdwnsyh with his epic lettering of the #typeyeahlogo 👏🏻 Join the challenge by designing your best version of the ‘Typeyeah’ logo and post it to Instagram with the hashtag #typeyeahlogo Each Tuesday a favourite will be selected and featured on the page. Rise and grind! It’s Tuesday! This weeks #typeyeahtuesdays entry goes to @venggaverdi with his lettering of the #typeyeahlogo 👏🏻 Join the challenge by designing your best version of the ‘Typeyeah’ logo and post it to Instagram with the hashtag #typeyeahlogo Each Tuesday a favourite will be selected and featured on the page. Rise and grind! It’s Tuesday! This weeks #typeyeahtuesdays entry goes to @madebymighty with his dope version of the #typeyeahlogo 👏🏻 Join the challenge by designing your best version of the ‘Typeyeah’ logo and post it to Instagram with the hashtag #typeyeahlogo Each Tuesday a favourite will be selected and featured on the page. Rise and shine! It’s Tuesday! This weeks #typeyeahtuesdays entry goes to @rockyrhoades_ with his lettering of the #typeyeahlogo 👏🏻 Join the challenge by designing your best version of the ‘Typeyeah’ logo and post it to Instagram with the hashtag #typeyeahlogo Each Tuesday a favourite will be selected and featured on the page. Rise and shine! It’s Tuesday! This weeks #typeyeahtuesdays entry goes to @frayart with their lettering of the #typeyeahlogo 👏🏻 Join the challenge by designing your best version of the ‘Typeyeah’ logo and post it to Instagram with the hashtag #typeyeahlogo Each Tuesday a favourite will be selected and featured on the page.